In 1984 we decided to undertake a big adventure – to move to one of the new areas of ‘Milton Keynes’. I was here before ‘Milton Keynes’, having been brought up in ‘Wolverton’ then living for the first 16 years of married life in ‘Stony Stratford’. My husband’s family lived in ‘Bletchley’ – they had moved here from ‘London’ in 1959. We looked around the estates that were currently being built. We felt that we would feel more at home in ‘Great Holm’. The history of Great Holm – what there is of it! ‘Great Holm’ had only recently come into existence with building beginning in 1982. Before this, it had been farmland in the parish of ‘Loughton’ – its name coming from an old field name which appears on the ‘Loughton’ map dated ‘1769, Great Holme’. Somehow the “e” has been lost! ‘Holme’ means flat land by a river, submerged in times of flooding. 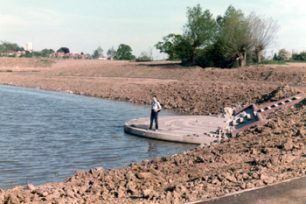 No river here – just ‘Loughton Brook’ – but this is the area where one of ‘Milton Keyne’s’ balancing lakes – ‘Lodge Lake’ – has been constructed. ‘Lodge Lake’ takes its name from a farm that was nearby, just across ‘Bradwell Road’ in ‘Loughton’. Long gone is ‘Little Loughton Windmill’ c1360, which was in a field appropriately named ‘Windmill Hill.’It seemed to be the only thing of note in this area before 1982. One of the first things we noticed about ‘Great Holm’, on moving here, was how windy it was. We live not far from where I think the windmill was sited, in the region of ‘Bowood Court’. The theme of the street names chosen for ‘Great Holm’, was royal residences and stately homes. A pun on ‘great homes’? Our new house was to be built by ‘Wilcon Homes’, in a street called ‘Hampton’. This is shown on the 1984 ‘New City Map’, 4th edition, but curiously, at this time, ‘Hampton’ is shown to extend to the H5 ‘Portway’ grid road. Later, this end section became part of ‘Attingham Hill’, itself having had a name change from ‘Arundel Hill’ as shown on the 1983 map! 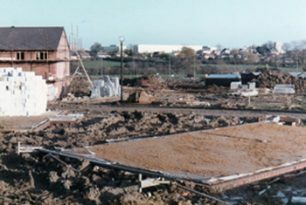 We were one of the first families to move in to the ‘Edgecote Park’ development in July 1985. So we lived on a building site for the next couple of years. It was not just watching our house and others being built that provided interest. ‘Lodge Lake’ was being landscaped and a ‘Redway’ constructed next to it. A large mound of earth in the centre of ‘Great Holm’, was being made into a play area. 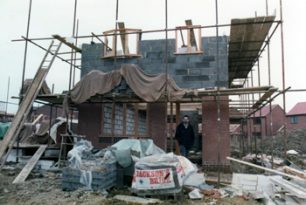 Opposite to it, ‘Holm Base’ – our Community Meeting Place, a facility provided by the ‘Development Corporation’ – was in its finishing stages. In 1989, our son was born, and I then felt more a part of the community. We went to ‘Mums and Toddlers’ together in the ‘Meeting Place.’ At 3 years old he started playgroup there. When he was 4 ½ years, he began his school days at ‘Holmwood First School’. I soon became a parent helper and went in one afternoon a week. I really enjoyed helping the children with a variety of activities. I became really involved in the community when I became a ‘Parish Councillor’ for’Great Holm’ on ‘Loughton Parish Council’ in 1991. Nearly 19 years later, I am still there but now on the local NAG (Neighbourhood Action Group) as well! Well, 25 years have flown by and I’ve now lived longer in ‘Great Holm’ than anywhere else – and it’s not only me that’s wearing out! The long slide in the play area, on the manmade hill, has started to slip down and the rest of the play equipment is old and shabby. So regeneration is beginning – any day now a £90K total refurbishment will take place. Over the years, ‘Great Holm’ has acquired a fire station, ‘The Grebe’ pub, ‘Hilltops’ (a really excellent health centre which will soon have a pharmacy), ‘Great Holm General Store’ and ‘The Kam Tong Garden’ – a Chinese restaurant overlooking the lake. ‘Great Holm’ is a good estate to live in. It is well placed at only half a mile from ‘Milton Keynes Central’ railway station and just over a mile to the city centre (with its great shops and other facilities). In contrast, it also has pleasant open areas around ‘Lodge Lake’ with ‘Loughton Valley’ linear park nearby, for walks though the ancient village of ‘Loughton’ to the ‘Teardrop Lakes’. The original of this contribution was created as part of the My Recollections website – a collection of stories and memories written by a group of learners on a Living Archive creative IT course. I love Milton Keynes and I love Great Holm, I have lived in MK since 1984 and have lived in Great Holm since 1999. Always looking to find out more of where I live and what it would have been like all those years ago. Very interesting, this brings back a lot of memeories! Does anyone who lives on Great Holm who bought their house from new still have any of the original developers sales brochures? In particular the Broseley Estates at Huntingbrooke and Westwood Close? and the Wilcon Homes estate?